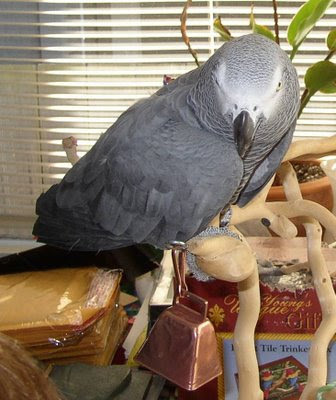 Corky was a feisty little guy, a Congo African grey (Psittacus erithacus)that was a rescue from a really deplorable living condition! He came to us with acute arteriosclerosis thanks to being raised on a diet of breakfast sausage and toast. He never fledged, so he was unable to fly. He loved rides in the car, probably because of being flightless. He would follow us around the house and patiently sit on the floor at our feet. He would chase our Goffin's cockatoo, Kid Cadra, whenever he could; unfortunately for Corky the Goffin's had the advantage of flight! He loved to cuddle under the bed sheets and watch television prior to going to bed. But every once in a while the little cuss would give us a nip, just because. He carried on many a conversation intelligible only to himself, but his two favorite phrases were: Whoa! and Don't Break That Door! He suffered acute cardiac and respiratory arrest on March 4, 2006. Fortunately for all concerned, we were just putting him to bed at the time the event occurred and we rushed him to the animal hospital, to no avail. We were able to hold and cuddle him in his final moments, and I still find it hard to type these words! I know that Corky has gone on to birdie paradise. The night after he died he came back to me in a dream and gave me one last farewell Whoa! Karl: Please Add My Name to the List!